It was all smiles for Mr Faisal Saleh owner of Arafat Coast dishes hotel in Nakuru, as he was extremely happy after seeing University of Nairobi students streaming in, in large numbers on Friday afternoon. Mr Faisel explains how he was happy to imagine how his sales return could have been high after he saw the students since during the better part of the day business was not good. Later on after the students were done with the late afternoon meal, everything turned chaotic as they started chanting WAIGURU MUST PAY! WAIGURU MUST PAY! WAIGURU MUST PAY! And the students began walking out if the restaurant. 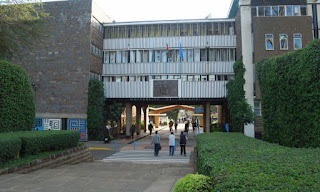 The accumulated bill which the student had consumed totaled up to Ksh14,000. Waiters tried to make them pay but their efforts bore no fruits and it was a rough time for the guard outside who tried to prevent the students from leaving but he was wrestled to the ground as they left. Not only did they do their drama in the restaurant but also proceeded to a nearby supermarket and raided the Liquor section and made away with tens of bottles and later boarded their school bus which was on standby at the parking bay.